As we know, centrifugal pump plays an important role for drilling muds transfer in solid control system. Such as, the drillings from mud tank to shale shaker, the pump is the connection as bridge. As the object is drilling mud from deep ground, Aipu centrifugal pump is designed for anti-abrasive, anti-corrosive with a long service life. These pumps are designed for a wide range of flow rates, from a few gallons per minute to thousands of gallons per minute. SB series drilling mud centrifugal pump can be designed from 3×2 to 8×6. Selecting pump is according to flow rate demand. Furthermore, the flow rate is related with motor power, head, electric system, the impeller size. Centrifugal pump in drilling mud process system is mainly power supply. And pump drilling fluid from mud tank to mud process equipment. Such as desander, desilter, or mud cleaner cones, decanter centrifuge. It also can be combined with venturi hopper to mix drilling fluid completely. 1.The impeller of centrifugal pump is specially designed to have a wider flow pass and smooth vanes , with larger flow area and smooth fluid pass , making the pump efficiency and energy saving , 10 % higher than similar products . Adopt international advanced level of high wear – resistant hard alloy mechanical seal, has a long service life. And auxiliary seal use packing seal, to prevent accidents. Imported bearing ensure the centrifugal pump running time is long and stable running. Bearing used lubricating oil and lubricating grease two lubricating ways, the service life is greatly lengthened. Use more thick pump shell, passage shape is more reasonable, the turbulence is reduced to the minimum than conventional. 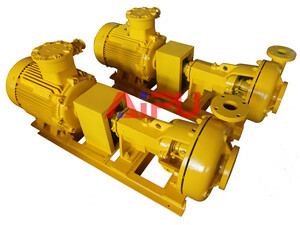 Pump body with open structure, installation, repair and maintenance more convenient. Impeller, flow components adopt high wear resistant cast iron , guarantee the abrasion , corrosion resistance, life is improves by 50% . Aipu solids control’ blog will provide some information for your reference. If you do need details or have interest on our equipment please feel free to contact us.